Woori Bank Job Circular 2018 has been found on my site. Woori Bank is the leading commercial bank in the global financial market. Woori Bank has been published recruiting to Woori Bank Officer and Senior Officer. Woori Bank incorporated in 1899 in the Republic of Korea and a flagship company of global reputed Woori Financial Group. Woori Bank leads the industry in establishing a clean banking model in the Global financial market based on financial stability, sound risk management, revenue growth and optimal allocation of capital after having experience for 112 years. ■ Job Description: Candidates should be well conversant in preparation of credit appraisal, evaluation of credit risks, analysis of financial information and financial projections including Balance Sheet, Income Statement, and Cash Flow Statement. ■ Education Qualification: MBA/ Master’s Degree or Equivalent (Preferably in Finance, Economics or Law discipline). ■ Job Experience: At least 2 years of continuous experience in CRM in any commercial bank in BD. ■ Compensation and Benefit: Negotiable. 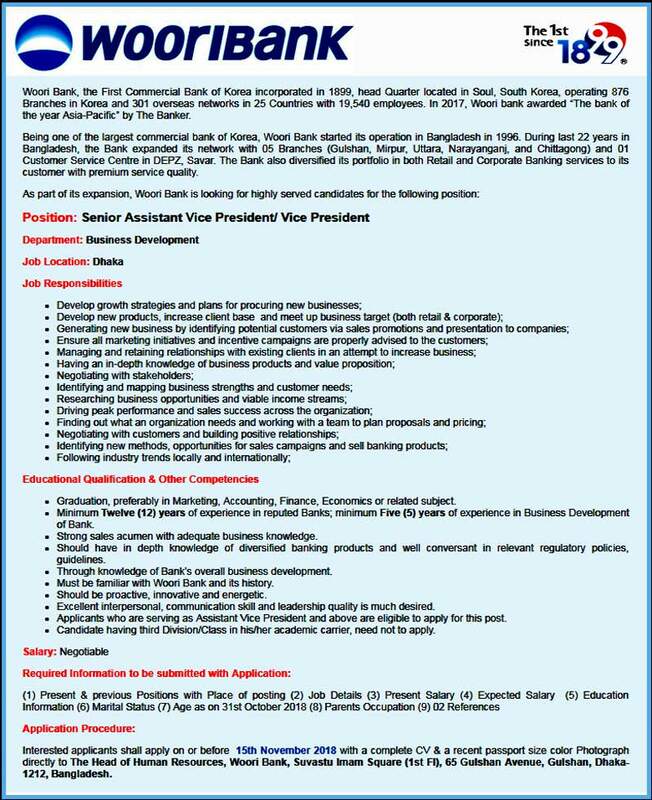 ■ How to Apply: Apply with full Resume to the Head of Human Resources, Woori Bank, Suvastu Imam Square (1st Floor), 65 Gulshan Avenue, Gulshan, Dhaka- 1212, Bangladesh. All candidates are advised to provide the following information on a separate paper accompanying with a job application letter and a complete Curriculum Vitae /Resume.